It’s that time of the year – when ideas are floated but things aren’t really set in stone yet. From Italy we find that there could be two Michelin-shod Maserati MC12s in the 2007 FIA GT Championship – a Racing Box car for Miguel Ramos and Luca Capellari and a Playteam Sara Free car for Toni Vilander / Alessandro Perguidi. If the former transpires, that will mean a return to the championship for the 2004 FIA GT Champion Luca Cappellari, who raced in the Italian Championship in 2005 and 2006. It could be very interesting seeing Michelin-shod MC12s going head to head against Pirelli-shod Vitaphone cars. The Playteam car performed very well at Mugello this season. 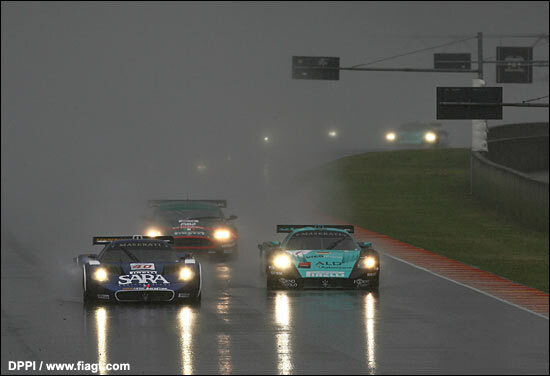 Before that confrontation (possibly) comes about next season, there’s still one round of the 2006 Championship to come, at Dubai in just over two weeks’ time, and it seems that there will be eight GT1 cars present. The Phoenix Aston Martin wasn’t on the ship that left Genoa, and the Balfe Saleen didn’t race at the penultimate round at Adria anyway. The Proton-Felbermayr team was known to have ordered a new Porsche 997 GT3-RSR, to accompany one of its 996 GT3-RSRs for next year, and that team is likely to race at Sebring, followed by a season of the Le Mans Series. In the field of prototypes, it was a surprise to find this morning that the Swiss Spirit Courage LC70 is for sale: we’re chasing up that news.